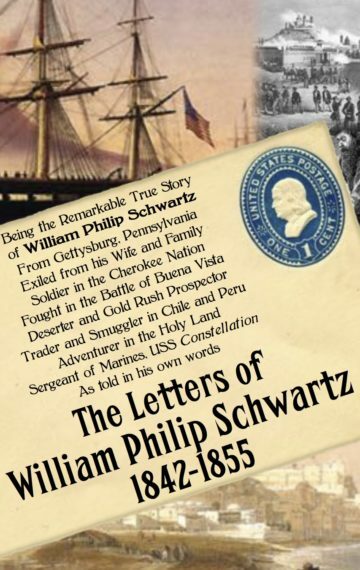 Exiled from his wife and family, soldier in the Cherokee Nation and the Mexican-American War, deserter, Gold Rush prospector, trader and smuggler in the Pacific, adventurer in the Holy Land, and Sergeant of Marines, USS Constellation. This is the remarkable true story of William Philip Schwartz, first war photographer, as told in his own words. From 1842 to 1855, this 19th century soldier and adventurer wrote a series of vivid and detailed letters to members of his family, describing people, places, and events that make history come alive. A pioneer in the field of photography, his images of people and scenes from the Mexican-American War are the first known war photographs. From personal tragedy to heroic triumph, from poverty to wealth and back again, this incredible true story makes for unforgettable reading for anyone interested in history.